Heritage and cultural management is an integral part of the tourism sector and it has a potent role in the development of the tourism industry as well. Therefore, it is important to understand the role of heritage and cultural industry along with the organizations which belong to this industry. The report focuses on the various aspects of heritage and cultural management industry with a special reference to the growth and development of the industry and the purpose of the heritage and cultural attractions within the travel and tourism industry. The report also attempts to shed light on the Roles, responsibilities and ownership of organizations in the heritage and cultural industry and Roles, responsibilities and ownership of organizations in the heritage and cultural industry. Cultural heritage and tourism are significantly interdependent and the growth of tourism industry potently indicates the development of the reservation of cultural heritage as well. In European countries like UK the cultural industries are considered to be important contributor in the GDP of the country and thus it has become a potential source of employment as well (Smith, M., 2013). Considering Uk it can be stated that there are several organizations which are involved in the cultural and the heritage industry of the country. Heritage can be defined as the conglomerate of the natural and cultural business environment which is constituted of the places that have historical importance and along with that bio diversity, cultural practices and customs, landscapes and has significant collection from past. It is often considered as the historical development of time and sheds light on the interrelation between the past practices and present customs. It is a major factor that helps in understanding the origin of modernity. History of heritage The grand tour which was usually taken by the aristocratic and affluent people became an custom in the 1660. The British nobility was the practitioners of the custom along with the protestents of the Northern European countries. The middleclass could only avail the trip only after these trips became affordable after the advent of the railway. Such grand tours were depicted as post Oxbridge trip to France or Italy in order to quest for art and culture. Rome is considered to be one of the most important cultural pilgrimages for several centuries and even today. It is marked as the center of the seven pilgrim churches. The Seventeenth century was marked by as the era of learning and it increased the rate of travelling significantly. Travelling used to be considered as an integral part of the education as well. England is consisted of picturesque rural sites and conserved natural coasts and it also has rocks from historic periods Triassic, Jurrasic and quentary periods. 33% of the cost lines of this country is preserved and it is considered to be one of the most famous coasts of the world which has chalk cliffs and sheer cliffs. National museum policy advice and establishment of the museums and galleries. Encouragement regarding the engagement of art and music and spending funds on arts. The essence of the conflict has been fundamentally framed upon the flagrant shift that has taken place in the mindset of the core tourists. This shift has been characterized by the introduction of the urban aspects, which appears to undermine the historical relevance of heritages. It is rife, that majority of the tourists happen to be amazed by the aspect of developing a tourism industry instead of admiring the authentic assets which are supposed to consolidate their respective stance in the prevalent history. In this regard, the connoisseurs of the aesthetic aspects of the intensive artifacts used to snigger on the note that this rapid and consistent growth of capital from the tourism industry has nothing to do with the genuine admiration of their assets that symbolizes their perception of heritage. The moot essence of the conflict resembles with the pertinent clash that intends to opine the fact that growth of capital is not been a potent index of admiration of cultural richness. In this advent where some of the countries have experienced stable and persistent growth of economy mainly from the tourism sector and the majority of the respective officials appear to project this as a milestone of global appreciation of their artifacts. On the other hand, the remaining rest of the conflict intends to transmit the fact the massive leap in tourist attraction can never be a reliable indicator of acknowledgement of their cultural assets and the tourists appear to be inclined towards the urban aspects of this advent. In this regard, it can be said that the conflict prevailing in Barcelona and Venice displays nothing but the analogue of the ancient conflict that growth of capital is not a reliable indicator of the fact that address the authentic admirers of cultural assets. As per the circumstantial scenario, it is to some extend true that the respective authorities have imparting excessive vehemence on the development of urban amenities of a tourist destination which reflects nothing but the spirit of sheer undermining of their intensive heritages. On the other hand, those who snigger on the note of stimulating capital and urbanization can be persuaded that art is nothing but the reverse side of the same coin where economy wish to co-exist. 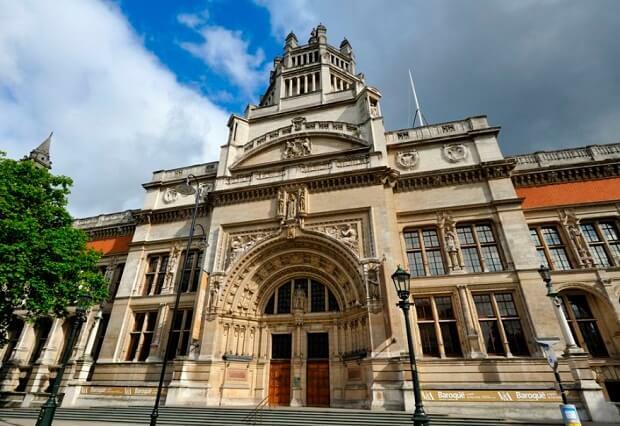 The Victoria and the Albert museum is one of the most famous museums of UK and it is also the largest museum of the country. The collection of the museum is broad and it includes 4.5 million curios and artefacts. This museum is funded by the Department of Culture and Media and Sports and contents several old artefacts of global cultural origins. This museum provides the visitors of UK an important opportunity to experience the grandeur of Asian Arts with different artefacts from countries like Japan, China as well as several Islamic countries. This museum is a significant source of knowledge attracts tourists from all over the world. Another important fact that requires to be mentioned that they serve the purpose of creative advertisement of the country which functions significantly in the promotion of tourism in the country (Liu, 2014). The facility that this museum offers is the ability to acquire study rooms for the visitors in order to know the history of the country even better. Because of this museum several visitors visit UK every year and it significantly contributes in the economic growth of the country. Along with the study rooms the museum authority also offers tours which are guided and organized lectures and seminars as well. Because of the diverse collection of artefacts from different historical era and different cultural backgrounds, the museum significantly attracts the worshippers and admirers of art fro all over the globe. As it is considered the most romantic museum of UK, every year couples from different nations and countries prefer to visit this museum. Focusing the museum there are several hotels and accommodations have developed in the area as tourists generally prefers to stay more than one day in order to explore the museum completely. Apart from the cultural museums there are several science museums that also attract tourists from all over the world and it serve the purpose of delivering knowledge on science and technology along with that medical history and its development as well. The customers that prefer to visit the science museums are the science enthusiasts rather than the art lovers. Different educational institutions organize tours centering such museums. According to the social studies the museums significantly contributes in the development of the tourism industry. It is important to note that UK museums are freely accessible and does not charge for the visits. However, significantly because of the museums several tourists every year opt for touring the country and that indicates a large number of people avail hospitality facilities, shopping and travelling as well (Liu, 2014). It indicates a profitable generation of the state revenue. The travel and tourism of the country is significantly influenced because of the museums. There are several hotels near the museums that earn a good amount of annual revenue because of the tourists coming to visit the museums. Because of the increase in the number of tourists the infrastructures such as hotel businesses, transport systems and other hospitality services are also improving. These areas have become potential centers of businesses due to a large number of tourists. Both of the museums under the study exist for different reasons and purposes and both are successful in their own way to attract the customers or the visitors. Both of the museums serve their individual purposes and effectively attract tourists and have established an environment that serves the purpose for the visitors to impart knowledge from the museum. It is of immense importance to understand d the roles and responsibilities of the ownership in the heritage and cultural industry particularly in regards to the aspect of cultural tourism. In this section of the report the impact of different types of ownership has been evaluated and the roles and responsibilities of the organizations are been analyzed. There are many organizations worldwide that take part in several campaigns and events in order to protect the heritage attributes of the country and they also intends to conserve the cultural heritage of the country (Liu, 2014). It is important to understand the significant role played by such organizations. The ownership of the management of the heritage and cultural sites based on their nature can be classified into three types and they are private, public and voluntary. The aims and objectives of these three types of organization are different to each other. The public organizations are owned and operated by government and their primary objective is the conservation of the heritage sites and also they seek to provide and increase public access to the heritage sites. These organizations also attempt to provide education and knowledge regarding these sites in order to generate revenue. As these organizations significantly tends to conserve the heritage sites it also works as the catalyst of tourism development and it significantly contributes in employment, generating foreign investments and private sponsorships for the conservation of the heritage sites. English Heritage, Historic Scotland, Northern Ireland Environment Agency (formerly the Environment and Heritage Service) and Manx National Heritage are some of such organizations. The primary aim of the private organization is to generate maximum amount of revenue from the profit and recreation through utilizing the productivity of the cultural and heritage sites as the medium of recreation of the tourists. The voluntary or the nonprofit organizations in the heritage and cultural industry earn only for the necessary existence and maintenance (Raj and Griffin, 2015). They do not concentrate upon generating profits by their conservation of their heritage sites and cultural attributes of the sites. There are various nonprofit organizations that provide voluntary services and they are museums, churches and historic buildings conservation funds, heritage alliance, Architectural Heritage Fund, War Memorial Fund are some of such organizations. 3.2 Analysis of roles and responsibilities of organizations in the heritage and cultural industry. Training: With the help of training procedure the organization aims to develop new educational tools and it also conducts the training across the globe in order to emerge awareness among different generations. Information: in order to make the tourists and the public aware of the importance of conserving the heritage sites and the cultural attributes it has published more than 90,000 books , specialized journals, articles and reports in more than 40different languages. Research: in order to protect the cultural heritage of the country and in order to include more people in the process of protection, it organizes and coordinates several meetings in order to devise several common approaches and methodologies. Along with that, it has also promoted the international definition of ethics, criteria and the technical standards which are necessary for the conservation. Cooperation and advocacy: The organization also attempts to provide technical advice and along with that collaborative visits and training process globally (Prohaska, 2015). It has also developed and provided teaching and training materials in order to build effective public awareness regarding the issue of heritage conservation. Role of methods of interpretation of the methods within the heritage and culture industry. It helps in increasing the awareness of the visitors and also helps in widening the perspective of the visitors towards the pleasure acquired by nature and cultural heritage through the resources of the museums (Prohaska, 2015). It also helps the visitors to be involved in the nature and history with the help of an accumulation of their personal perspective with the history of the country. It also attempts to affect the personal performance of the individuals their approach to the public history regarding the intelligent use of the natural possessions along with that it also safeguards the natural and the cultural heritage. It also invokes the admiration of the visitors regarding the natural surroundings and cultural heritage of the country (Prohaska, 2015). It helps in providing the visitors with pleasant and momentous experience that helps the purpose of tourist satisfaction and facilitate the way of success for the tourism industry of the country. The museums significantly helps in increasing public awareness and support an agency’s role and its management objectives along with its policies. The mentioned objectives are linked to the understanding and conscious approval of the museums by the visitors and it potently helps in increasing the knowledge of the visitors. Signs and labels are the most widespread and inexpensive modes that helps in the process of interpretation. It functions through employing everlasting symbols and placards. This facility permits the tourists of the museums to move around at their individual will and swiftness through the location. Along with the advantages, there are several disadvantages of the signs and labels as well. The major drawback of signs and labels are it can often be artistically unpleasant and can ruin the momentous environment or ambience of the museum as well (Ashworth and Larkham, 2017). The quantity of the content of the signs can reflect imperfection and it can characteristically permit a mere single facet of the location that can be obtained by the tourists. However, it serves the purpose of the interpretative substance. Leaflets and guidebooks are some of the significant printed information providers that come as tangible information provider to the tourists. It helps the tourists with the location and also permits the tourists to moves according to his or her individual velocity and it has no surrounding brunt. Guidebooks are often cited as significant mementos and serves the purpose of a significant location stopover (Xu and Fox 2014). However, several experts have also criticized the guidebooks and leaflets to be individually principled observation of the history. It does not portray the collective consciousness of history and performs as a manifestation that is more likely to be a technique to notify. The popularity of the multi media has grown significantly over the last few years and is accepted by the tourist widely. 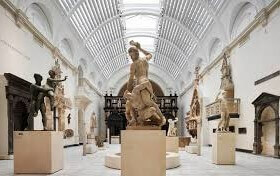 This practice is followed by several museums especially in the interiors. Over half the century multimedia has survived significantly a variety of different arrangements. Audio guides are preferred by the tourists as they serve the purpose of the tour guides successfully and it has been practiced by several museums like Phoenix museum of Art. The significance of the report lies in the understanding of the moot essence of heritage and cultural industry along with the organizations which are included in the industry. The report provides an insight to the importance of the culture and heritage industry in the development of the tourism industry of a country. In respect to UK it can be stated that it is potent to conserve the heritage and cultural attributes associated with the heritage industry as it helps in the economic development of the country and also sustains the essence of tourist satisfaction associated with the cultural heritage of the country. Ashworth, G. and Larkham, P. eds., 2013. 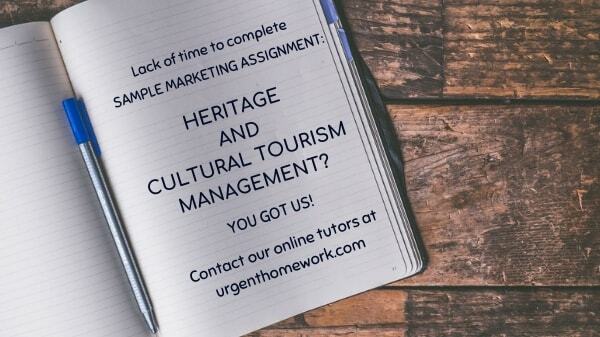 Building a new heritage (RLE Tourism). Routledge. Boniface, P., 2013. Managing quality cultural tourism. Routledge. Bourdeau, L. and Gravari-Barbas, M., 2016. World Heritage, Tourism and Identity: Inscription and Co-production. Routledge. Briassoulis, H. and Van der Straaten, J. eds., 2013. Tourism and the environment: regional, economic, cultural and policy issues (Vol. 6). Springer Science & Business Media. Du Cros, H. and McKercher, B., 2014. Cultural tourism. Routledge. Liu, Y.D., 2014. Cultural events and cultural tourism development: Lessons from the European Capitals of Culture. European Planning Studies, 22(3), pp.498-514. Mowforth, M. and Munt, I., 2015. Tourism and sustainability: Development, globalisation and new tourism in the third world. Routledge. Perfetto, M.C. and Presenza, A., 2017. Conceptualising industrial heritage tourism management. ;International Journal of Tourism Policy, 7(2), pp.110-128. Prohaska, S., 2015. Contemporary issues in cultural heritage tourism. Raj, R. and Griffin, K.A. eds., 2015. Religious tourism and pilgrimage management: An international perspective. cabi. Smith, M., 2013. The Routledge handbook of cultural tourism. Routledge. Timothy, D.J. ed., 2017. Managing heritage and cultural tourism resources: Critical essays, Volume one. Routledge. Xu, F. and Fox, D., 2014. Modelling attitudes to nature, tourism and sustainable development in national parks: A survey of visitors in China and the UK. Tourism Management, 45, pp.142-158.